Overview of the magnetic excitation spectrum of CFTD and its interpretation in terms of spin waves or spatially extended fractional excitations. Credit: Nature Physics 15 December 2014. Electrons may be seen as small magnets that also carry a negative electrical charge. On a fundamental level, these two properties are indivisible. 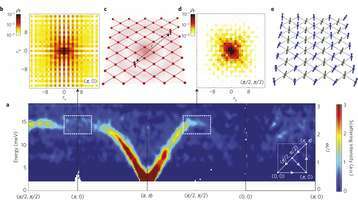 However, in certain materials where the electrons are constrained in a quasi one-dimensional world, they appear to split into a magnet and an electrical charge, which can move freely and independently of each other. A longstanding question has been whether or not similar phenomenon can happen in more than one dimension. A team lead by EPFL scientists now has uncovered new evidence showing that this can happen in quasi two-dimensional magnetic materials. Their work is published in Nature Physics. Which features make this like a "liquid"? Do they mean zero viscosity or friction or both? How did this "liquid" relate to the electon holon/spinon splitting they started the article with?